Ayers, H.d.. "Drainage Basin". The Canadian Encyclopedia, 07 May 2015, Historica Canada. https://www.thecanadianencyclopedia.ca/en/article/drainage-basin. Accessed 26 April 2019. A drainage basin is an area of land that contributes the water it receives as precipitation to a river or network of rivers. A drainage basin is an area of land that contributes the water it receives as precipitation to a river or network of rivers. Drainage basins are defined by topographical features, called drainage divides, which determine the direction the water flows. Canada has six major drainage basins: the Arctic, Pacific, Western Hudson Bay and Mississippi, South and East Hudson Bay, Great Lakes–St Lawrence and Atlantic. Average discharge is the volume of water flowing out of a stream or river, measured over a period of time and expressed as the average number of cubic metres draining per second (m3/s). When thinking about average discharge, an Olympic swimming pool (2,500 m3) serves as a helpful reference. For example, the Mackenzie River has an average discharge of 9,910 m3/s, or the equivalent of about four Olympic pools. This basin of 3.58 million km2 receives streamflow from the northern two-thirds of Alberta, northern British Columbia, northern Saskatchewan, the Yukon, the Northwest Territories and Nunavut, including the Arctic islands. The estimated average annual discharge rate is 15,500 m3/s. The largest river in the region is the Mackenzie. 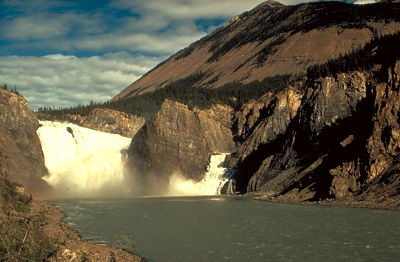 The rivers contributing to the Arctic Drainage basin include the Peace, Athabasca and Liard rivers, all of which rise on the eastern slopes of the Rocky Mountains. The largest river in the region is the Mackenzie. It has an average discharge of 9,910 m3/s into the Beaufort Sea. The longest flow route in the region is 4,241 km, from the head of the Finlay River in northern British Columbia via the Peace River, Lake Athabasca, Great Slave Lake and the Mackenzie River to its mouth. This length exceeds by over 1,000 km that of any other Canadian river system. The Mackenzie's peak flow occurs in June; otherwise it is quite uniform from May to September, when 70 per cent of the annual discharge occurs. This uniformity is attributable to the influence of the relatively flat Barren Lands east of the river and to the many lakes, the largest of which, Great Bear and Great Slave, each cover about 30,000 km2. Ice is significant to the hydrology of the region and much of the terrain is underlain by permafrost. Lakes and rivers are open from about 15 June to 1 November in the more northerly part of the Mackenzie Basin, less in the Arctic islands. The Pacific drainage basin, in the Cordillera region, is 1.08 million km2. It lies west of the Continental Divide and extends from the boundary of Alberta and British Columbia into the Yukon near the Mackenzie Delta. The basin sheds water into the Pacific Ocean at an average rate of 21,200 m3/s. The high average discharge rate is attributable to the large amounts of precipitation received at higher elevations in the Rockies and coastal mountain ranges, caused by moist air masses moving off the Pacific Ocean. Stream water supply is, however, highly variable. Rivers in the region include the Fraser River, the Columbia River system and the coastal rivers. The 1,368 km Fraser River flows through spectacular canyons and rich agricultural land to provide drainage to more than 230,000 km2 of interior British Columbia. The mean discharge rate is about 3,620 m3/s. Highest flows are experienced in June; lowest in March. The risk of flooding in the Fraser's lower reaches has long been a matter of concern. The Columbia River system in southeastern British Columbia has an average flow at the international boundary of 2,800 m3/s. A portion of this flow originates from 50,000 km2 of drainage area in the US. The Okanagan River, which flows to join the Columbia south of the international boundary, is of great benefit to fruit growers in the semiarid valleys. Coastal rivers, including the Fraser, teem with salmon during spawning season. The other large rivers, the Skeena, Nass and Stikine, discharge a combined average of 3,800 m3/s into the Pacific. The Yukon, with a drainage area of 800,000 km2, has an average discharge of 2,300 m3/s where it crosses into Alaska. In addition to the benefits to fisheries, agriculture and hydroelectricity, the waters of the Pacific drainage provide a valuable resource to the lumber, pulp and paper, and mineral processing industries as well as municipalities. This region of 2.64 million km2 includes all of Manitoba, most of Saskatchewan, the southern third of Alberta, most of the District of Keewatin, a part of Ontario west of Lake Superior and about 150,000 km2 immediately south of the Canadian–US border. A 27,500 km2 zone of southern Saskatchewan and southeastern Alberta drains into the Mississippi Basin and then to the Gulf of Mexico. The major rivers discharging into western Hudson Bay are the Hayes, Nelson, Churchill, Kazan and Thelon. The estimated mean rate of discharge for the region is about 9,400 m3/s. The most important section of the drainage basin is the 1 million km2 drained by the Saskatchewan–Nelson river system. The Bow, Oldman and North and South Saskatchewan rivers rise on the eastern slopes of the Rockies and flow east for 1,900 km through the central plains. Extensive tracts in the plains region drain into interior depressions (sloughs). Many of these sloughs have no outlet, and many others have outlets only in the wetter years to the principal streams which enter a chain of lakes in south-central Manitoba. Here the flow is joined with that of the Red River flowing in from the south and the Winnipeg River from the east. The latter carries drainage from southeastern Manitoba, the Lake of the Woods region of Ontario and Minnesota. The flow discharges from Lake Winnipeg (24,000 km2) into Hudson Bay via the Nelson River. The mean flow of the Nelson at its outlet is 2,370 m3/s. The principal source areas of streamflow for the Nelson are the eastern slopes of the Rockies and the lake area of Manitoba, northwestern Ontario and the adjacent states. The Nelson and Churchill rivers are sites of large hydroelectric-power generating facilities. The North and South Saskatchewan river system is important to agriculture since it flows through a region of fertile soils limited in their productivity by uncertain rainfall. The water supply from the Bow, Oldman, North and South Saskatchewan rivers and their tributaries is vital to cities, towns and industries of Alberta and Saskatchewan. The high variability of local tributary flow has necessitated construction of many dams to provide carry-over storage from years of abundant flow to years of low discharge. This region includes most of northern Ontario and western and northern Québec, an area of about 1.4 million km2. There are at least 15 individual watersheds of 30,000 km2 or more in area. The largest of these are the Severn, Albany, Moose, La Grande Riviere and the Koksoak. The region, part of the Canadian Shield, consists of massive ancient crystalline rocks. As a result of glaciation there are large areas of lakes, ponds and swamps. In some parts as much as 15 per cent of the drainage area is covered by fresh water. The many lakes result in fairly uniform rates of river flow throughout the year. The waters are generally of good quality and minimally influenced by human activities. Although the rivers and lakes are ice-covered annually for six months, water continues to flow under the ice. The lowest flows occur in March for the more southerly streams, April for those draining into Ungava Bay. The average annual rate of flow of all streams draining into Hudson, James and Ungava bays is estimated at 20,000 m3/s. There is considerable hydroelectric potential in the region. For example, the James Bay Project is one of the largest in the world. This basin is dominated by the Great Lakes, covering 245,000 km2. About one half the basin is Canadian, Lake Michigan is wholly within the US and the international boundary passes through Lakes Superior, Huron, Erie, Ontario and St Clair. Most of the land drainage from the Canadian portion is from the Canadian Shield; the St Lawrence Lowlands make a small contribution. The lowlands include peninsular Ontario, bounded by Georgian Bay, Lake Huron, St Clair, Erie and Ontario as well as the fringes of the St Lawrence River. The Great Lakes–St Lawrence system provides an important navigable waterway of nearly 4,000 km from Ile d'Anticosti to the head of Lake Superior (see St Lawrence Seaway). Most streams in the lowlands are less than 300 km long. They are important for industry, agriculture and urban water supply, and provide recreational opportunities for the region's urban population. The intensive land use in the southern parts of the basin results in high variability of seasonal flows, localized flooding, periodic low summer flows and impaired water quality. The average flow in the Niagara River at Queenston, between Lake Erie and Lake Ontario, is 5,760 m3/s. 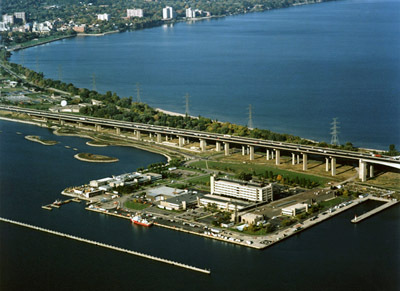 By the time the St Lawrence River reaches Cornwall, downstream of the Great Lakes, the average flow is 6,430 m3/s. After the river is joined by the Ottawa River at Montréal and by other tributaries, its average flow is 9,800 m3/s. The St Lawrence Basin is the most southerly in Canada. This factor, coupled with the lakes' relatively large areas of open water, results in significant evaporation losses. Streamflow is reduced to about 25–30 per cent of received precipitation. Nevertheless, the large lakes maintain a steady rate of flow throughout the year, and from one year to the next. The region includes that part of Canada draining to the St Lawrence River (from Montréal eastward), the Gulf of St Lawrence and the Atlantic Ocean. It includes all of Newfoundland, Nova Scotia, New Brunswick, Prince Edward Island and part of Québec, an area of 1 million km2. 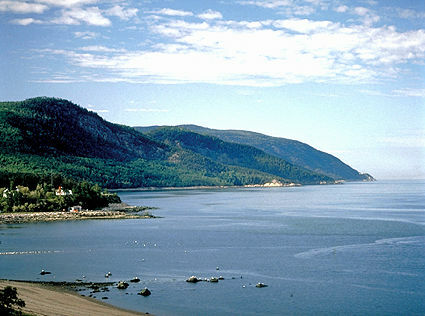 The drainage from the north shore of the St Lawrence and Labrador is largely from the Canadian Shield, where 10–15 per cent of the area is freshwater lakes. The rivers are short and drainage is well developed as a result of long periods of erosion. About 9 per cent of Newfoundland and 5 per cent of Nova Scotia are lakes. There are few lakes in New Brunswick and PEI. Several watersheds make up the larger basin. The largest watersheds discharging into the St Lawrence River are the Manicouagan (45,000 km2) and the Saguenay (88,000 km2). The Churchill River in Labrador drains 79,800 km2 and discharges directly to the Atlantic Ocean. The Saint John River, in New Brunswick, draining 55,400 km2, discharges into the Bay of Fundy. Most of the large rivers of the basin have extensive hydroelectric installations. The total discharge of the watersheds in the basin averages 21,000 m3/s. See also Geological Regions; Physiographic Regions.